Outrage spread across the political spectrum over the weekend after dozens of teens, many from an all-male Kentucky Catholic school and some wearing bright red "Make America Great Again" baseball caps, appeared to mock and chant over the voices of a small group of Native Americans who were singing on the steps of the Lincoln Memorial at the conclusion of a march in Washington, D.C. The inaugural Indigenous Peoples March coincided with the annual March for Life, and it appears that at least some of the students had come from that anti-abortion march. 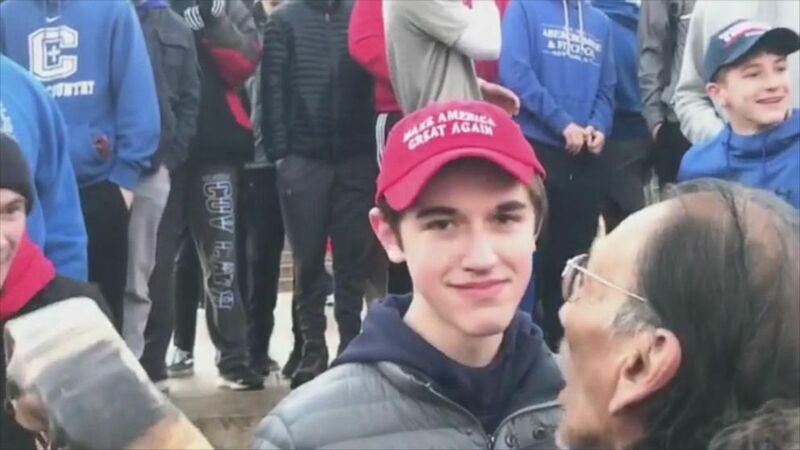 The most jarring of several viral videos of the incident pinballing through cyberspace shows a young man in a red "MAGA" hat, later identified as Nick Sandmann, who stands motionless and smirking for more three minutes, with his face inches from that of Vietnam veteran Nathan Phillips -- who is rhythmically banging a drum and singing along with a handful of fellow Native Americans. Phillips remains outwardly placid and composed throughout the viscerally distressing confrontation, according to video shot inches from the other side of Philips’ face and posted online. Another video showed Phillips appear to approach the group of students before the stare down. I heard them say, 'Build that wall, build that wall.' This is indigenous lands, you know. We’re not supposed to have walls here. We never did. Before anybody else came here we never had walls. We never had a prison. In an interview following the confrontation on Friday that was posted to Instagram, Phillips said he wished the throng of teens would put their energy into helping feed the poor. "I heard them say, 'Build that wall, build that wall,' you know?" he said in the interview. "This is indigenous lands, you know. We’re not supposed to have walls here. We never did. Before anybody else came here we never had walls. We never had a prison. 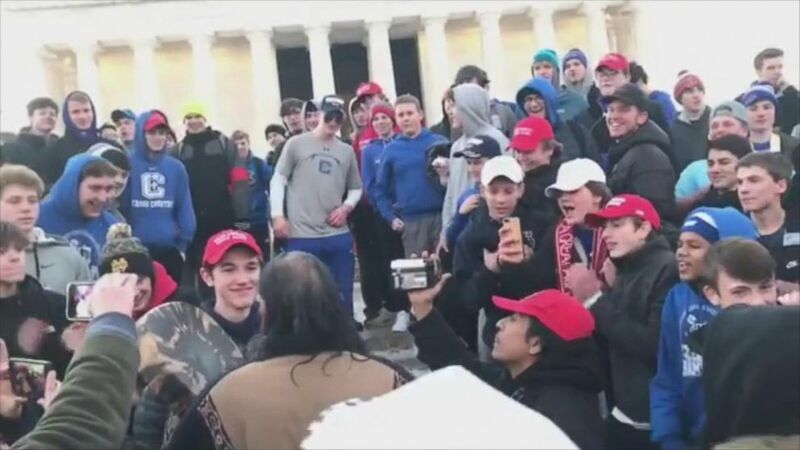 (@earthchores via Storyful) A diocese in Kentucky apologized Saturday, Jan. 19, 2019, after videos emerged showing a student in a "Make America Great Again" hat mocking Native Americans outside the Lincoln Memorial after a rally in Washington. "We always took care of our elders, took care of our children," Phillips continued. "We always provided for them, you know? We taught them right from wrong. I wish I could see that energy of the young men to, you know, put that energy to make this country really great. Helping those that are hungry." In a separate interview with the Washington Post, Phillips said that the dozens of teens began to swarm around his group as they concluded their march and were getting ready to leave. “It was getting ugly," he told the newspaper. One student who was part of the group Kentucky youth group claimed he and his classmates were initially targeted by a middle-aged African-American man with a megaphone who yelled racial slurs at them as they were doing school cheers while taking a head count and preparing to get on buses to go home. "We then went back to our school chants ("CCH") and clapped," the student said in a statement to ABC News, asking to remain anonymous. "At that point, an Indigenous American man with a few other men approached the center of the boys and in particular one boy (who goes to my school but I do not know him). He was beating his drum and chanting something that I couldn't understand. The boy from my school didn't say anything or move -- he just stood there. But Kaya Taitano, a college student who posted one of the videos of the confrontation, said no one from the Native American group instigated the episode. "No one from the indigenous peoples' march called anyone names," Taitano told ABC News. "It was a peaceful movement. Prior to this madness, they all joined hands and danced in a circle." Sandmann, a junior at Covington Catholic High School in Park Hills, defended his actions in a statement on Sunday and said he never heard "any students chant 'build that wall' or anything hateful or racist at any time." "I realized everyone had cameras and that perhaps a group of adults was trying to provoke a group of teenagers into a larger conflict," Sandmann said. "I was not intentionally making faces at the protestor. I did smile at one point because I wanted him to know that I was not going to become angry, intimidated or be provoked into a larger confrontation," he added. Fury over the incident began to boil over on Saturday and Sunday as the videos started to spread widely. "This Veteran put his life on the line for our country. The students' display of blatant hate, disrespect, and intolerance is a signal of how common decency has decayed under this administration," Rep. Deb Haaland, D-New Mexico, who is part Native American, tweeted tweeted Saturday. "Heartbreaking." “In spite of these horrific scenes, I refuse to shame and solely blames these children for this type of behavior. Instead, I turn to the adults and administration that are charged with teaching them, and to those who are silently letting others promote this behavior." Less than an hour later, the diocese of Covington and the Covington Catholic School issued a joint statement. The contrast between the calm dignity and quiet strength of Mr. Phillips and the behavior of the #MAGA brats who have absorbed the spirit of Trumpism – this spectacle is a lesson which all Americans can learn. Meanwhile, Twitter lit up over the incident, with many conservative voices condemning the hostility on display among the teens. “The contrast between the calm dignity and quiet strength of Mr. Phillips and the behavior of the #MAGA brats who have absorbed the spirit of Trumpism – this spectacle is a lesson which all Americans can learn,” conservative commentator Bill Kristol, long a critic of the president, said in a tweet. Earlier this week, Native Americans leaders called on Trump to apologize for invoking the Wounded Knee Massacre and the Battle of Little Bighorn in the course of mocking Sen. Elizabeth Warren, whom he often refers to derisively as “Pocahontas,” in a tweet. The incident came three days after what would have been the 90th birthday of Martin Luther King Jr. and prompted a response from the assassinated civil rights icon's daughter, Bernice King. "We are not a post-racial or post-racism nation," Bernice King wrote on Twitter. "Courageous people, like this Native elder, face overt racism and racist ideologies and systems each and every day. This is ugly, America. Truth, education and corrective action matter." On Sunday, Bernice King tweeted, "America has cowered in the drudgery of racism and bigotry for 400+ years. Colonialism and white supremacy have violently shaped systems, including education, across the globe. What we teach NOW matters. Our children are influenced by the hate OR the love we give. Choices." America has cowered in the drudgery of racism and bigotry for 400+ years. Colonialism and white supremacy have violently shaped systems, including education, across the globe. What we teach NOW matters. Our children are influenced by the hate OR the love we give. Vincent Schilling, the associate editor of Indian County Today, a website covering Native American issues, told ABC News that Phillips has told him in previous interviews about being spat on when he returned home from Vietnam and being taunted at subsequent indigenous peoples' rallies, including one where university students threw beer cans at him. "He's been the subject of racism and ridicule many times in his life," Schilling said. "And to see him stand there and maintain his composure and resolve was just an incredible testament to his heart and his ability to be a warrior." ABC News' Sabina Ghebremedhin and Chris Donovan contributed to this report.